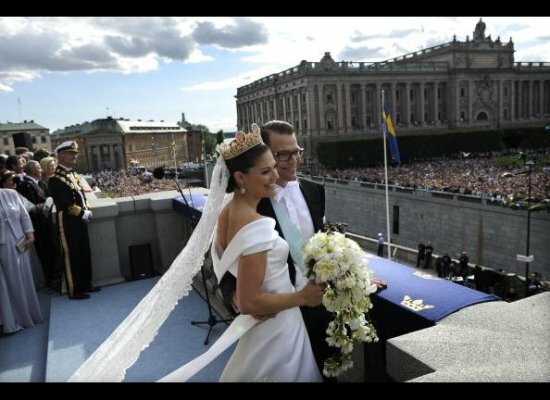 It has been a week since all eyes were on the beautiful Crown Princess Victoria as she married Daniel Westling. She wore a custom-made ivory silk off-the-shoulder gown by Swedish designer Par Engsheden, according to InStyle.com, and custom Roger Vivier silk satin pumps with rhinestone buckles. The princess topped off her elegant bridal look with the ultimate fairy-tale princess accessory: A towering cameo-bedecked tiara worn by her mother to her 1976 wedding. Around 1,200 guests attended the wedding, including members of royal families from around the world, from Belgium and Spain to Japan, Jordan, and Monaco. Nearly 60,000 people have joined a Facebook group called “Refuse to pay for Victoria’s wedding!” complaining about public money being used to pay for the wedding.